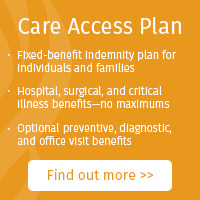 What are Indemnity Health Plans? Large medical bills, expected or not, can be stressful. Oftentimes, consumers must meet their health insurance deductible before plan benefits fully kick in. Hospital and surgical health indemnity insurance plans, can help reduce out-of-pocket costs by paying fixed benefit amounts to help with covered medical expenses resulting from hospitalization, surgery and certain outpatient therapy services. We currently have three insurance providers for this product. THIS IS A SUPPLEMENT TO HEALTH INSURANCE PLAN AND IS NOT A SUBSTITUTE FOR THE MINIMUM ESSENTIAL COVERAGE REQUIRED BY THE AFFORDABLE CARE ACT (ACA) LACK OF MAJOR MEDICAL COVERAGE (OR OTHER MINIMUM ESSENTIAL COVERAGE) MAY RESULT IN AN ADDITIONAL PAYMENT WITH YOUR TAXES.